A good hiking watch does not only show time and date, but also provides you with crucial information such as altitude, location, air pressure, sunrise/sunset times etc. This can help you with navigation, planning and weather prediction. 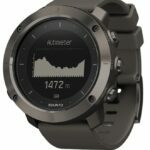 Watches with hiking-specific features are very popular these days and the companies behind them are making great progress when it comes to combining design with useful technology. This selection of the best hiking watches includes four watches which are equipped with GPS and two without (one is listed in the honorable mentions section at the bottom). GPS indeed has its advantages but since some hikers prefer watches without GPS (due to longer battery life, lower price, less complicated user interface etc. ), we wanted to include some options for them too. 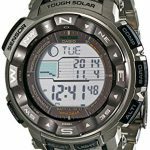 All watches in this selection have compass, altimeter and barometer – features which we consider essential for activities such as hiking, trekking, mountaineering and backpacking. As new models of hiking watches are being released regularly, we continuously update this selection in order to always recommend you the best products available. 1. Buying a Watch for Hiking – What is important? A hiking watch should have features beyond those of an ordinary watch. The most important features that every hiking watch should have are barometer, altimeter and compass. The barometer detects changes in the atmospheric pressure and thus allows you to easily predict the weather; if the atmospheric pressure is increasing, the weather will improve and reversely; if the atmospheric pressure is falling, the weather will worsen (clouds, rain etc.). A rapid drop in the atmospheric pressure normally indicates a storm rising. All watches listed in this review show the atmospheric pressure and its tendency graph (how the atmospheric pressure has changed in the last hours). Furthermore, they also all have a storm alarm feature which warns you if the atmospheric pressure drops significantly. An altimeter shows you how high above sea level you are and is based on barometric pressure or GPS data. A GPS altimeter is much more precise than a barometric altimeter and doesn’t require any calibration. The altimeter feature comes in handy for navigation – it is easier to find your location on a map if you know how high above the sea level you are. A compass shows you the four cardinal directions (North, East, South and West) as well as bearing and is thus crucial for navigation. With the compass feature and a proper map, you can easily do triangulation to determine your current location. Some hiking watches are also equipped with a thermometer which comes in handy on multiday trips. You can, for example, measure the temperature outside the tent in order to appropriately layer your clothes before you set out on the trail again. However, it is important to note that the thermometer will normally measure temperature most accurately when the watch is not on your wrist as your body heat otherwise affects the measurements. Watches for hiking ordinarily feature robust cases and highly durable straps. Some watches are also equipped with Sapphire glass lenses for increased resistance against scratches – in comparison to the more common mineral crystal lenses. However, watches with Sapphire glass lenses are also significantly more expensive. Many advanced hiking watches support GPS (some support GLONASS as well) which is currently the best solution for navigation and tracking. A GPS watch allows you to instantly get the coordinates of your current location. Furthermore, it can also show current speed, distance, ascent, descent and other GPS-based information. You can import routes in GPX or similar formats to most GPS watches. These routes can then be used for navigation as the watch shows your current location in relation to the GPX route. 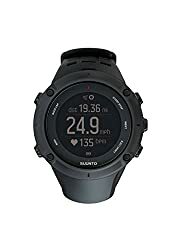 GPS watches also track (record) your activities and allow you to export the details (duration, distance, average speed, total ascent, total descent and other parameters) to web or mobile apps such as Suunto Movescount or Garmin Connect for analysis. However, GPS watches have a much shorter battery life than watches without GPS. Nevertheless, they are normally equipped with rechargeable batteries. On very long backpacking trips a solar charger enables you to recharge your GPS watch far away from the civilization. Many hiking watches also show and record the heart rate. 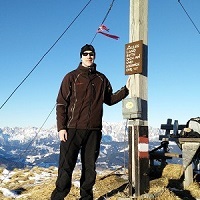 The most sophisticated hiking watches feature wrist-based heart rate monitors (optical heart rate monitors) while others require a chest strap transmitter (sometimes to be purchased separately). The heart rate monitor feature comes in handy on hiking trips as it allows you to maintain a steady pace throughout the hike. Weight 3.03 oz. 2.86 oz. 3.14 oz. 2.82 oz. 2.40 oz. Case Size 1.9 x 1.9 x 0.6 in. 2.0 x 2.0 x 0.7 in. 2.0 x 2.0 x 0.7 in. 2.0 x 2.0 x 0.7 in. 2.2 x 1.9 x 0.5 in. The Garmin Fenix 5 watch replaced the highly popular Garmin Fenix 3 watch in 2017. It is basically a Smartwatch with a high-resolution color display that is designed for harsh outdoor conditions. The watch is made of very robust materials – the bezel is made of stainless steel while the lens is made of Sapphire glass (only Sapphire models). Therefore, the watch offers great abrasion resistance and durability. Nevertheless, the design of the watch makes it elegant enough to wear to business meetings without thinking twice. 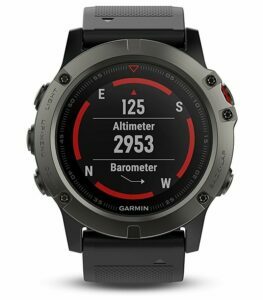 The Garmin Fenix 5 watch is equipped with a 3-axis compass, altimeter, barometer and thermometer. For more accurate temperature readings, you can connect it to an external temperature sensor (Garmin Tempe). The compass and altimeter are calibrated automatically via GPS. Other features made possible by GPS include that the watch can automatically set the time based on your location and of course offers navigation and tracking. You can import routes and points of interest and the watch will provide you with the directions. Activities can be saved and detailed information about each activity can be accessed through the Garmin Connect app (desktop or mobile version). The Garmin Fenix 5 has numerous fitness features like V02 estimator, recovery advisor, race predictor etc. and is also suitable for other sports like running, swimming and skiing. The Connect IQ connectivity allows you to personalize the watch with apps, widgets and unique watch faces (for example a weather widget can be installed on the watch so that you can access the weather forecast directly on the watch). 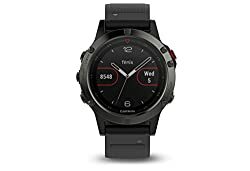 The Fenix 5 watch can be synchronized with a Smartphone (Garmin Connect mobile app is available for both iOS and Android devices) to show texts, alerts, emails and other notifications. Another useful feature is that the watch can be paired with the Garmin Virb action camera and thus you can control the camera directly from the watch. 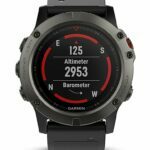 The Garmin Fenix 5 watch is available in three different sizes; Fenix 5S (42 mm/1.7 in. ), Fenix 5 (47 mm/1.9 in.) and Fenix 5X (51 mm/2.0 in.). The 5X model, in addition to the features mentioned above, also supports maps – it can show a topographic map which is very useful for navigation. 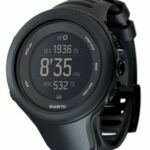 The Suunto 9 Baro watch is an incredible timepiece which can easily compete with the Garmin Fenix 5 mentioned above. The Suunto 9 Baro watch is equipped with a stainless-steel bezel and a color touch screen. However, the watch also features buttons so that you can easily use it if you are wearing gloves. The watch is equipped with GPS, altimeter, barometer, thermometer and compass. Navigating trails with the watch is very easy as the waypoints and GPX routes can simply be imported to the watch from the Suunto Movescount which also allows you to easily plan routes before your hike. Furthermore, you can find existing routes from other Movescount users and import them to your own watch – not least by using the Heatmap feature which shows popular routes within a given area. In addition to planning, the Movescount app also offers a complete overview of your workouts (a calendar shows workouts by parameters such as duration, distance, burned calories etc.). The Suunto 9 watch can also track the distance walked, find a route back to your starting point, show current speed and much more. It comes with a wrist-based heart rate monitor which eliminates the need for wearing a heart rate belt. Bluetooth connectivity allows you to connect the watch to your Smartphone and receive notifications from the phone on your watch. Note that the Suunto 9 watch is also available without barometer but for hiking and backpacking we do recommend the Baro version. The Baro version is also equipped with Sapphire glass for good abrasion resistance. The Suunto Ambit 3 watch is another great choice for hikers and mountaineers as it offers great functionality and durability. 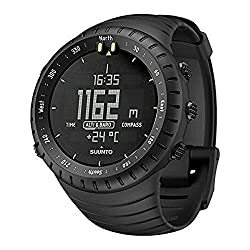 In comparison to the watches above, the Suunto Ambit 3 has a less sophisticated display (matrix) and doesn’t support GLONASS but is also less expensive and slightly easier to use (the watch has a very user-friendly interface). 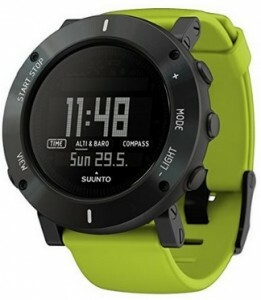 The Suunto Ambit 3 watch has GPS, altimeter, barometer, thermometer and compass. It has a great GPS reception because it uses a high-performance GPS antenna and naturally supports navigation and tracking. The watch can be synchronized with Movescount (for analytics and planning) and can show real-time GPS data (such as speed, distance, elevation gain etc.). The Ambit 3 is Suunto’s first Bluetooth-compatible watch. Therefore, it can easily be connected to a Smartphone and show you incoming and missed calls, messages and other notifications from your phone when you install the Suunto Movescount app (available for Android and iOS devices). 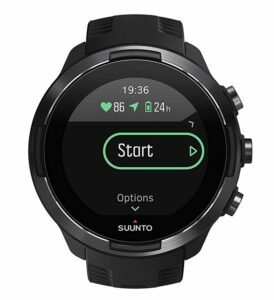 You can also find other apps for the watch on the Suunto Movescount web platform and you can even create your own apps for the watch. Suunto Ambit 3 is a great watch for hiking and mountaineering as it offers numerous hiking features. 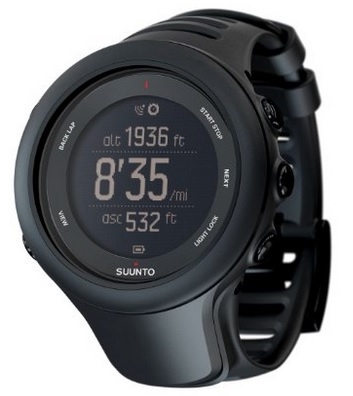 It comes in four different versions – Suunto Ambit 3 Peak, Ambit 3 Vertical, Ambit 3 Sport and Ambit 3 Run. 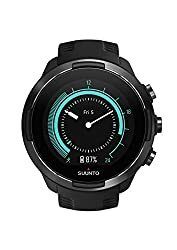 However, the features described here apply only to the Suunto Ambit 3 Peak watches which are designed particularly for hiking and mountaineering. Some Suunto Ambit 3 Peak watches are equipped with Sapphire glass lenses. 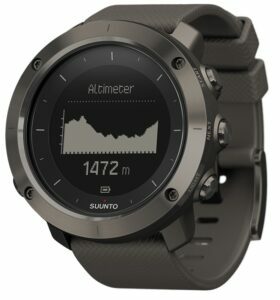 The Suunto Traverse watch instantly became very popular among hikers, mountaineers and other outdoorsmen due to the attractive design and advanced features. The watch is aimed towards recreational outdoorsmen (not athletes as the Suunto Ambit 3) and thus features a less sporty but more elegant design. 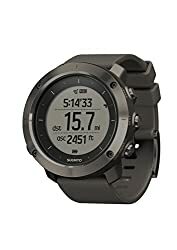 In comparison to the Suunto Ambit 3, it lacks the ability to connect to external Bluetooth PODs and does not support the multisport mode, swimming mode and advanced training analysis. 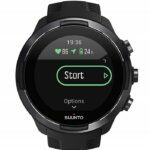 However, the Suunto Traverse is equipped with some handy features such as vibration alerts, step counter, flashlight backlight and GLONASS navigation – all of which the Suunto Ambit 3 lacks. Otherwise the watch has quite similar features to the Suunto Ambit 3 – it is equipped with altimeter, barometer, thermometer and digital compass. As many Suunto watches, the Traverse watch can be easily connected to the Movescount app which shows the summary of your workouts and allows you to import points of interest, GPX routes as well as to apply tweaks to the watch. As the watch is equipped with Bluetooth you can also synchronize it with a Smartphone (both iOS and Android) and manage the watch settings and data directly from there plus get notifications from your phone on the watch. The Suunto Traverse is an amazing watch which does not only offer many useful features but also looks very cool and stylish. The watch is available with a silicone or textile strap as well as with a Sapphire glass lens or mineral crystal lens. The Casio Pro Trek PRW-2500T-7 is a very durable non-GPS watch which comes with many useful features. The watch is equipped with digital compass, barometer, altimeter and thermometer. The watch uses a solar-rechargeable battery which has a life of 5 months without any exposure to light. Thus, there is almost no chance that you will be surprised by an empty battery. Accurate time is kept by calibration radio signals which are received up to 6 times per day. The compass supports magnetic declination correction and has a bearing memory. The barometer shows a trend graph and helps you predict the weather. 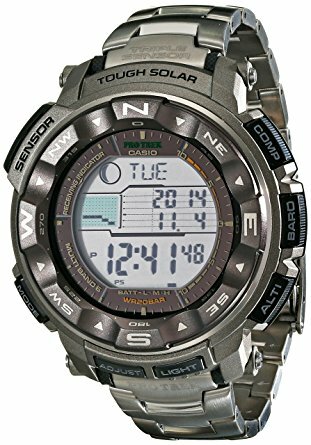 The Casio hiking watch is also equipped with a pressure change indicator which warns you about significant changes. More basic features include stopwatch, countdown, calendarand alarms. The Casio Pro Trek PRW 3000 1A is a great watch which will satisfy every hiker who doesn’t need a GPS watch. The below listed products were once included in our best five selection but as newer and better products were released we moved them into this section. The Suunto Core Crush watch is a great option for those who want a watch with numerous hiking features but not necessarily GPS. It is also much less expensive than all of GPS watches reviewed above. The Suunto Core is equipped with compass, altimeter, barometer and thermometer. 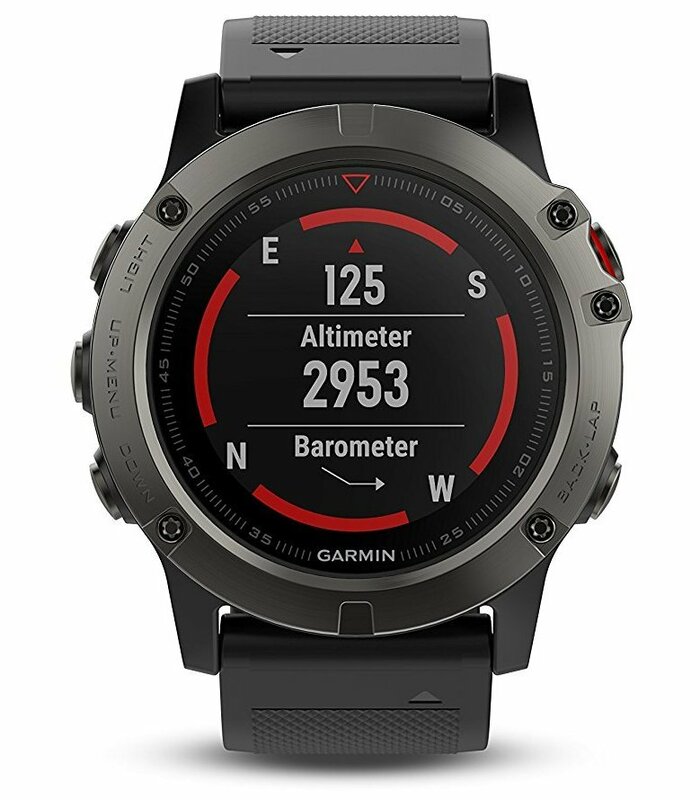 It switches between altimeter and barometer mode automatically (it detects if you are changing altitude) and provides you with weather information from the atmospheric pressure trend graph and trend indicator while in the barometer mode. If a storm is rising, the watch detects this, and the storm alarm goes on. The basic features of the watch are time, alarm, dual time and sunset/sunrise times. The replaceable battery lasts for approximately 1 year. Unfortunately, the Suunto Core watch is not compatible with a heart rate belt which would indeed come in handy on hiking trips. The Suunto Core watch is due to its simplicity and durability a great choice for those who want a straightforward hiking timepiece with great features. It comes in three different versions which all offer the same functionality but differ in materials; Premium (Sapphire glass lens, stainless steel case, silicone strap), Classic (mineral glass lens, composite case, elastomer strap) and Crush (mineral glass lens, composite case, silicone strap).